Those already familiar with Strawberry Hill House may be surprised to discover that this world-famous symbol of English Gothic architecture has even stronger Jewish associations. Understandably enough, Strawberry Hill is primarily associated with Sir Horace Walpole, the man who built it. Yet in the 19th century it had not one but two ‘Jewish’ owners: Frances Countess of Waldegrave, whose father John Braham was an internationally famous opera singer whose career began when he was talent-spotted as a street-urchin and invited to train as a chazan; and the fabulously wealthy de Stern family, a typical fin-de-siècle dynasty of international Jewish bankers. The Sterns were certainly more conventionally Jewish than Frances Braham, the Christian daughter of a man who eventually abandoned the faith that had given him a start in life. 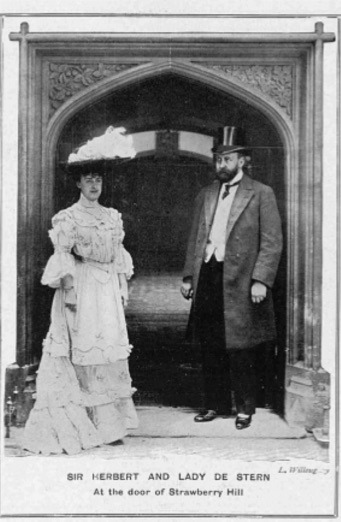 Yet contemporaries referred to this famous beauty and glamorous society hostess as “the Jewish Lady Waldegrave”. Like her great friend Benjamin Disraeli, she chose to play up to her Jewish background, commissioning a painting of Masada by Edward Lear to match another one of Jerusalem. Both hung at Strawberry Hill, where visitors on September 16 will be able to learn a little more about Frances Braham and Lady de Stern. There will be short talks at 12 and 3pm. The exhibition is free for anyone who buys a ticket to visit the house.